as a specific preparation for leadership in the ministry of the church. During this course I will spend 6-8 hours per week, above and beyond my regular work hours, doing things in ministry that I do not normally have the opportunity to do. With my field supervisor and the professor for the course, I will be developing specific learning goals to focus my work and learning during this time. SFE spans three terms. The first, Jan-April, 2016, has a broad focus including “observation and engagement of particular aspects of worship, ministry, mission and education.” The second term, Sept-Dec, 2016 has a particular focus on Pastoral Care. And the third term, Jan-April 2017, has an emphasis on leading an education project. I have been authorized to complete my SFE this term at Woodlawn! I am very excited to be able to do this. Rev. Phillip Kennedy will be my supervisor (as he has completed the course necessary to do this). I will be focusing my learning on funerals, hospital visitation, prayer and I will even have the opportunity to preach once or twice! I will meet with Phillip weekly to review my education and my personal learning goals that have been created in consultation with Phillip and Jody Clark (the professor for the course). • To develop my ability and confidence as a preacher. • To increase my confidence and comfort level in leading extemporaneous prayer. • To learn how to prepare a funeral service. 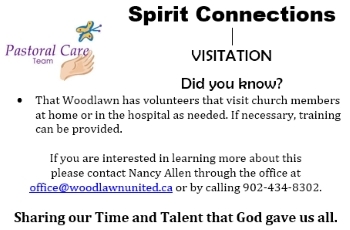 • Participate in pastoral care through hospital visitation. Shirley MacLeod, Mary-Kate Evans and Keith Musselman have agreed to form my Lay Resource Team who will provide some evaluation and support for me during these next few months. I will also be looking for folks to share with me some of their experiences at Woodlawn for reflections I must write for the class. I hope that this new step in our relationship will be beneficial for both my learning and also for the mission of Woodlawn. I appreciate the support, feedback and opportunity provided to me by the congregation of Woodlawn as I take another leap of faith in this journey to ordination.